Not to be confused with Colostrum. Coronal section of human cerebrum. The claustrum is indicated by the arrow. Transverse section of human cerebrum. The claustrum is indicated by the arrow. The claustrum (Latin for: to close or shut) is a thin, bilateral structure which connects to cortical (ex. pre-frontal cortex) and subcortical regions (ex. thalamus) of the brain. 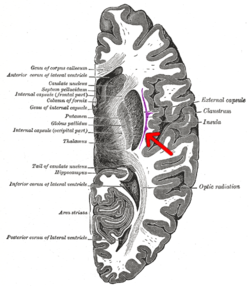 It is located between the insula laterally and the putamen medially, separated by the extreme and external capsules respectively. 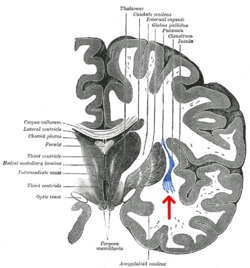 The blood supply to the claustrum is fulfilled via the middle cerebral artery. It is considered to be the most densely connected structure in the brain allowing for integration of various cortical inputs (ex. colour, sound and touch) into one experience rather than singular events. The claustrum is difficult to study given the limited number of individuals with claustral lesions and the poor resolution of neuroimaging. The claustrum is made up of various cell types differing in size, shape and neurochemical composition. Five cell types exist and a majority of these cells resemble pyramidal neurons found in the cortex Within the claustrum, there is no organization of cell types compared to the cortex and the somas of the cells can be a pyramidal, fusiform or circular shape. The principal cell type found in the claustrum is Type 1 cells, which are large cells covered in spiny dendrites. The claustrum usually connects to the cortex in an ipsilateral manner; however, the few that travel contralaterally are considerably weaker than the former. The claustrum acts as a conductor for inputs from the cortical regions so these respective areas do not become unsynchronized. Without the claustrum, one could respond to stimuli that are familiar to the individual but not to complex events. Additionally, the claustrum is essential in combining sensory and motor modalities so that various anatomical patterns are present. One of the proposed functions of the claustrum is to differentiate between relevant and irrelevant information so that the latter can be ignored. Cortical components of consciousness include the fronto-parietal cortex, cingulate and precuneus. Due to the claustrum's widespread connectivity to these areas, it is suggested that it may play a role in both attention and consciousness. The neural networks that mediate sustained attention and consciousness implicate numerous cortical areas, many of which overlap in connectivity with the claustrum. Previous clinical reports suggest that conscious processes are lateralized to the left hemisphere in humans. The claustrum is a small bilateral gray matter structure (comprising roughly 0.25% of the cerebral cortex) located deep to the insular cortex and extreme capsule, and superficial to the external capsule and basal ganglia. As mentioned, its name means “hidden or shut away” and was first identified in 1672, with more detailed descriptions coming later on during the 19th century. Although the regional neuroanatomical boundaries of the claustrum have been defined, there remains a lack of consensus in the literature when defining its precise margins. Despite this long history of reports on the claustrum, descriptions of its overall connectivity have been sparse. However, recent work has suggested that this mysterious structure is present in all mammals, with extensive connections to cortical and subcortical regions. More specifically, electrophysiological studies show extensive connections to thalamic nuclei and the basal ganglia, while isotopological reports have linked the claustrum with the prefrontal, frontal, parietal, temporal and occipital cortices. Additional studies have also looked at the relationship of the claustrum to well-described subcortical white matter tracts. Structures such as the corona radiata, occipital-frontal fasciculus and uncinate fasciculus project to the claustrum from frontal, pericentral, parietal and occipital regions. Reciprocal connections also exist with motor, somatosensory, auditory and visual cortical regions. Altogether, these findings leave the claustrum as the most highly connected structure per regional volume in the brain and suggest that it may serve as a hub to coordinate activity of cerebral circuits. Interestingly, even with this extensive connectivity, most projections to and from the claustrum are ipsilateral (although there are still contralateral projections), and little evidence exists to describe its afferent or efferent connections with the brainstem and spinal cord. In summary, the cortical and subcortical connectivity of the claustrum implies that it is most involved with processing sensory information, as well as the physical and emotional state of an animal. Inputs to the claustrum are organized by modality, which include visual, auditory and somatomotor processing areas. In the same way that the morphology of neurons in the spinal cord is indicative of function (i.e. rexed laminae), the visual, auditory and somatomotor regions within the claustrum share similar neurons with specific functional characteristics. For example, the portion of the claustrum that processes visual information (primarily synthesizing afferent fibers concerned with our peripheral visual field) is comprised by a majority of binocular cells that have “elongated receptive fields and no orientation selectivity. This focus on peripheral sensory system is not an isolated occurrence, as most sensory afferents entering the claustrum bring peripheral sensory information. Moreover, the claustrum possesses a distinct topological organization for each sensory modality. For example, there is a retinotopic organization within the visual processing area of the claustrum that mirrors that of visual association cortices and V1, in a similar (yet less complicated) manner to the retinotopic conservation within the lateral geniculate nucleus. The claustrum is made up of various cell types that differ in size, shape and neurochemical composition. Five types of cells exist and the majority of these cells are structurally similar to pyramidal neurons found in the cortex. Within the claustrum, the somas of the cells can be found with a pyramidal, fusiform or circular shape. The principal cell type found in the claustrum is Type 1 cells, which are large neurons covered in spiny dendrites. These cells receive inputs from the cortex, and their axons will then leave in a medial or lateral fashion and send reciprocal projections back to the cortex. GABAergic interneurons represent only 10%-15% of the neurons within the claustrum. Finally, many studies show that the claustrum is best distinguished structurally by its prominent plexus of parvalbumin-positive fibers formed by local interneurons. The claustrum has been shown to have widespread activity to numerous cortical components, all of which that have been associated with having components of consciousness and sustained attention. This is because of widespread connectivity to fronto-parietal areas, cingulate cortex and thalami. Sustained attention being from the connections to the cingulate cortex, temporal cortex, and thalamus. Crick and Koch suggest that the claustrum has a role similar to that of a conductor within an orchestra; as it attempts to co-ordinate the function of all connections. This “conductor” notion can also be supported through connections between claustral, sensory, and frontal regions. The claustrum has been confirmed to be reciprocally connected to the prefrontal cortex, visual, auditory, sensory, and motor regions respectively. Connections to these modalities provide insight into the functionality of the claustrum. Here it is proposed that the claustrum functions in the gating of selective attention. Through this gating process, the claustrum can selectively control input from these modalities to facilitate the process of “focusing”. It has also been suggested that it operates in the opposite context; through divisive normalization the claustrum may implement resistance to certain input modalities to prevent “distraction”. The claustrum, in order to facilitate consciousness, would need to integrate various sensory and motor modalities from various parts of the cortex. The anatomical connections of the claustrum have been observed using DTI (diffusion tensor imaging). Using fMRI looks at oxygenated blood levels in the brain as a way of observing the activity of specific cortical areas. Observed dampened effects with fMRI when anesthetized versus awake in rats, specifically claustrum connections to the medial prefrontal cortex (mPFC) and the mediodorsol thalamus (MD thalamus). As well it has been found that the claustrum anatomically is connected with the contralateral hemispheres claustrum and has strong functional connections. Connections with MD thalamaus, mPFC, and surrounding and distant cortical areas also exist. Electrical stimulation in the dorsal claustrum of cats elicits excitatory responses within the visual cortex. The claustrum is situated anatomically at the confluence of a large number of white-matter tracts used to connected different parts of the cortex. This additionally supports the notion of an integration center from these different modalities, such as sensory and motor. Gap junctions have been shown to exist between aspiny interneurons of the claustrum – suggesting a role in its ability to synchronize these modalities as input is received. The claustrum has the differential ability to select between task relevant information and task irrelevant information to provide directed attention. Per-unit volume in the cortex, it contains the highest density of connecting white matter tracts. This supports the notion of networking and coordination among different regions of the brain. As well, the claustrum has regional specificity to it, information coming in from visual centers project to specific areas of the grey matter neurons in the structure. The same is said of the auditory cortex. This is supported by unexpected stimuli inducing activation of the claustrum, suggesting an immediate focusing or allocation of function. In lower mammals (such as rats), claustral regions receive input from somatosensory modalities – this also supports as input from a “whisker” motor control perspective because of its sensory and discriminatory use in these mammals. Functionally it is proposed that it segregates attention between these modalities. Attention itself has been considered as top-down processing or bottom-up processing; both fit contextually with what is observed in the claustrum structurally and functionally. Supporting the notion that interactions occur with high-order sensory areas involved in encoding object and feature. Input from the prefrontal cortex for example will define attention, based upon higher-cognitive task driven behaviour. Moreover, Induction of electrical stimulation to the claustrum has been shown to induce the prevention of reading, a blank stare, and unresponsiveness. It has been reported that the claustrum has a basal frequency firing that is modulated to increase or decrease with directed attention. Projections to motor and occulomotor areas for example would assist with gaze movement, to direct attention to new stimuli by increasing the firing frequency of claustral neurons. Salvia divinorum is a derivative from a psychoactive plant that is capable of inducing loss of awareness. Drug application (salvinorin A) will work on its respective Salvinorium A receptors to induce synesthesia, where different sensory modalities are interpreted by different sensory cortex's – auditory sensation is smelt. This acts to support the idea of intrathalamic segregation and conduction (attention). The claustrum is saturated with Salvinorium A receptors, to which this chemical is capable of binding and eliciting this effect. High Frequency Stimulation (HFS) in cat claustrum(s) has the capability to induce autonomic changes, and induce “inactivation syndrome”. This syndrome is described as a decrease in awareness, suggesting some functional role relevant to consciousness. In humans this same effect can be observed. It has been reported that stimulation of the left claustrum in humans produced volitional behaviour, unresponsiveness and amnesia; also suggesting role involved in consciousness. Furthermore, MRI studies have shown that increased signal intensity with the claustrum has been associated with status epilepticus – a condition in which epileptic seizures follow one another without recovery of consciousness in-between events. As well, increased signal intensity has been found to be associated with Focal dyscognitive seizures; a seizure that does not involve convulsions yet elicits impairment of awareness or consciousness. The individual becomes unaware of his or her environment, and the seizure will manifest as blank or empty stare for a window of time. These show a role in consciousness and sustained attention by the claustrum. Using an operant conditioning task combined with HFS of the claustrum resulted in significant behavioural changes of rats; this included modulated motor responses, inactivity and decreased responsiveness – suggesting and supporting a functional role in sustained attention. Beyond this, studies have also shown that the claustrum is active during REM sleep, alongside other structures such as the dentate gyrus. These have associative roles in spatial memory, suggesting that some form of memory consolidation takes place in these areas. Functionally, the claustrum will integrate various cortical inputs through its connections, into one experience; consciousness. Based upon its structure and connectivity, its function is suggested to do with coordination of different brain function; i.e. the conductor analogy. Consciousness functionally can be divided into two components: (i) wakefulness, which is arousal and alertness; (ii) content of consciousness, which is the processing of content. A study of traumatic brain injuries in war veterans, was undertaken to better understand the functional role of the claustrum. Damage to the claustrum was associated with duration of loss-of-consciousness, but not frequency. Lesion size was correlated with greater duration of LOC events. Interestingly no consequences were shown to attenuate cognitive processing. In a single case-study, consciousness was shown to be disrupted when there was stimulation to the extreme capsule of the brain – is in close proximity to the claustrum – such that upon termination of stimulation, consciousness was regained. Another study looking at the symptomology of schizophrenia established that the severity of delusions was associated with decreased grey matter volume of the left claustrum; postulating that correlations exist between the structure and positive symptoms seen in this psychiatric disorder. Further supporting this correlation between schizophrenia and the claustrum is that there is an increase in white matter volume entering the claustrum. Negative correlations between grey matter volume, and severity of hallucinations in the context of auditory hallucinations of schizophrenia has been supported. As well, to see the total loss of function of the claustrum, lesions to both claustrums on each hemisphere would need to occur. In animals, through tract tracing, findings have shown that the claustrum has extensive connections throughout the cortex with sensory and motor regions along with the hippocampus. A variety of animal models have been used such as cats, rodents and monkeys. In cats, high-frequency stimulation (HFS) of the claustrum can alter motor activity, induce autonomic changes, and precipitate an “inactivation syndrome” described as “decreased awareness". Recordings, primarily in cats and primates, show that claustral neurons respond to sensory stimuli and during voluntary movements. Mapping from visual cortex to claustrum includes just a single map, which includes V1 and three other visual areas. Cells in the V1 are part of layer 6, which different from cells that go to the lateral geniculate nucleus; these cells use glutamate as their neurotransmitter. The cat claustrum has 3 defined zones: (1) the anterior dorsal zone, which connects to the motor and somatosensory cortex, (2) the posterior dorsal zone that has connections to the visual cortex and (3) a third zone that is ventral to visual one and connects to the auditory areas. Sensory input is segregated based on modalities and there is a high preference for peripheral sensory information. In the cat, input is received from various visual cortical areas and projects back to the area. These loops are retinotopical, meaning that regions getting visual input are responsible for the same region in the visual field as the area of the cortex that projects to the claustrum. The visual claustrum is a single map of contralateral visual hemifield, receiving information based on motion in the visual field's periphery and has no real selectivity. In terms of somatosensation, claustral neurons will receive whisker motor innervations. They then project back to the whisker motor and somatosensory cortex. This cortical-claustral-cortical circuit plays a role in whisker movements for orientation and palpation. In rats, motor whisker areas receive input from the ipsilateral claustrum but will then project to the contralateral claustrum. The sensory barrel cortex and primary visual cortex also receive input from the ipsilateral claustrum but send very few projection back to the claustrum. Studies therefore indicate distinct patterning of connectivity of claustrum with different cortical areas. These suggest, rather than a diffuse role, they play specialized roles in cortical processing. In mice, parvalbumin fibres are highly interconnected by chemical and electrical synapses. They are additionally also highly interconnected with claustrocortical neurons – suggesting that these inhibitory interneurons strongly modulate their activity. These local networks suggest to synchronize activity of claustrocortical projections to therefore influence brain rhythms and co-ordinated activity of different cortical brain regions. There are additional classes of inhibitory interneurons with local connections within the claustrocortical neurons. Recent experiments in mice monitoring claustrocortical axonal activity to changing visual stimuli suggest the claustrum signals stimulus changes. Interestingly although claustrocortical input to visual cortical areas were engaged, the strongest responses measured were in higher-order regions of the cortex, this included the anterior cingulate cortex which is densely innervated by claustral projection. In the monkey, there are widespread connections of the claustrum with allocortical and neocortical regions. These connections project towards the frontal lobe, visual cortical regions, temporal cortex, parieto-occipital cortex and somatosensory areas amongst others. The subcortical areas receiving projections are the amygdala, caudate nucleus and hippocampus. It is unknown if there are cortical regions that do not receive input from the claustrum. Additionally, large or small types of aspiny are reported in the monkey brain, which are classified as “local circuit neurons". The dorsal claustrum has bi-directional connections with motor structures in the cortex. The relationship between animal's movement and how neurons in the dorsocaudal claustrum behaves are as follows: 70% of movement neurons are non-selective and can fire to do any push, pulls or turn movements in the forelimb, the rest were more discerning and did only one of the three movements listed above. Damage to the claustrum can lead to various common diseases or mental disorders; delayed development of the structure leads to autism. The claustrum may be involved in schizophrenia as findings show an increase in positive symptoms, such as delusions, when the grey matter volume of the left claustrum and right insula is decreased. The claustrum is also seen to play a role in epilepsy; MRIs have found increased claustral signal intensity in those that have been diagnosed with epilepsy. In certain cases, seizures tend to appear to originate from the claustrum when they are involved in early KA seizures (Kainic-Acid induced seizures). A single case-study showed that consciousness was disrupted when the area between the insula and claustrum was electrically stimulated; consciousness was regained when stimulation stopped. Patients that had a lesion in their left claustrum were more likely to experience a loss of consciousness compared to those that presented with lesions outside of the claustrum. For example, a patient that was subjected to electrode stimulation at the claustrum stopped reading, stared blankly and was unresponsive. Once the electrode was removed, the patient resumed reading and could not remember the events of being dazed. ^ a b c d e f g h i j k l m n o p q r Crick FC, Koch C (June 2005). "What is the function of the claustrum?". Philosophical Transactions of the Royal Society of London. Series B, Biological Sciences. 360 (1458): 1271–9. doi:10.1098/rstb.2005.1661. PMC 1569501. PMID 16147522. ^ a b c d e f g Bayat A, Joshi S, Jahan S, Connell P, Tsuchiya K, Chau D, Syed T, Forcelli P, Koubeissi MZ (February 2018). "A pilot study of the role of the claustrum in attention and seizures in rats". Epilepsy Research. 140: 97–104. doi:10.1016/j.eplepsyres.2018.01.006. PMID 29324357. ^ a b c d e f g h i Chau A, Salazar AM, Krueger F, Cristofori I, Grafman J (November 2015). "The effect of claustrum lesions on human consciousness and recovery of function". Consciousness and Cognition. 36: 256–64. doi:10.1016/j.concog.2015.06.017. PMID 26186439. ^ a b c d e f g h i j k Brown SP, Mathur BN, Olsen SR, Luppi PH, Bickford ME, Citri A (November 2017). "New Breakthroughs in Understanding the Role of Functional Interactions between the Neocortex and the Claustrum". The Journal of Neuroscience. 37 (45): 10877–10881. doi:10.1523/JNEUROSCI.1837-17.2017. PMC 5678020. PMID 29118217. ^ a b c Braak H, Braak E (1982). "Neuronal types in the claustrum of man". Anatomy and Embryology. 163 (4): 447–60. doi:10.1007/BF00305558. PMID 7091711. ^ a b c Smith JB, Liang Z, Watson GD, Alloway KD, Zhang N (July 2017). "Interhemispheric resting-state functional connectivity of the claustrum in the awake and anesthetized states". Brain Structure & Function. 222 (5): 2041–2058. doi:10.1007/s00429-016-1323-9. PMC 5382132. PMID 27714529. ^ Stevens CF (June 2005). "Consciousness: Crick and the claustrum". Nature. 435 (7045): 1040–1. doi:10.1038/4351040a. PMID 15973394. ^ a b c Torgerson CM, Irimia A, Goh SY, Van Horn JD (March 2015). "The DTI connectivity of the human claustrum". Human Brain Mapping. 36 (3): 827–38. doi:10.1002/hbm.22667. PMC 4324054. PMID 25339630. ^ a b c d e f g h i j k l Goll Y, Atlan G, Citri A (August 2015). "Attention: the claustrum". Trends in Neurosciences. 38 (8): 486–95. doi:10.1016/j.tins.2015.05.006. PMID 26116988. ^ a b c d Koubeissi MZ, Bartolomei F, Beltagy A, Picard F (August 2014). "Electrical stimulation of a small brain area reversibly disrupts consciousness". Epilepsy & Behavior. 37: 32–5. doi:10.1016/j.yebeh.2014.05.027. PMID 24967698. ^ Bayer, S.A.; Altman, J. (1991-01-01). "Development of the endopiriform nucleus and the claustrum in the rat brain". Neuroscience. 45 (2): 391–412. doi:10.1016/0306-4522(91)90236-H. ISSN 0306-4522. PMID 1762685. ^ Baizer JS, Sherwood CC, Noonan M, Hof PR (2014). "Comparative organization of the claustrum: what does structure tell us about function?". Frontiers in Systems Neuroscience. 8: 117. doi:10.3389/fnsys.2014.00117. PMC 4079070. PMID 25071474. ^ Mathur BN (2014). "The claustrum in review". Frontiers in Systems Neuroscience. 8: 48. doi:10.3389/fnsys.2014.00048. PMC 3983483. PMID 24772070. ^ a b Edelstein LR, Denaro FJ (September 2004). "The claustrum: a historical review of its anatomy, physiology, cytochemistry and functional significance". Cellular and Molecular Biology. 50 (6): 675–702. PMID 15643691. ^ Buchanan KJ, Johnson JI (May 2011). "Diversity of spatial relationships of the claustrum and insula in branches of the mammalian radiation". Annals of the New York Academy of Sciences. 1225 Suppl 1: E30–63. doi:10.1111/j.1749-6632.2011.06022.x. PMID 21599698. ^ Grasby K, Talk A (March 2013). "The anterior claustrum and spatial reversal learning in rats". Brain Research. 1499: 43–52. doi:10.1016/j.brainres.2013.01.014. PMID 23318254. ^ Sherk, Helen (2014-01-01). "Physiology of the Claustrum". The Claustrum: 177–191. doi:10.1016/B978-0-12-404566-8.00005-2. ISBN 9780124045668. ^ Smythies JR, Edelstein LR, Ramachandran VS (2014). The claustrum : structural, functional, and clinical neuroscience. Academic Press. ISBN 9780124045668. OCLC 861211388. ^ Fernandez-Miranda JC, Pathak S, Engh J, Jarbo K, Verstynen T, Yeh FC, Wang Y, Mintz A, Boada F, Schneider W, Friedlander R (August 2012). "High-definition fiber tractography of the human brain: neuroanatomical validation and neurosurgical applications". Neurosurgery. 71 (2): 430–53. doi:10.1227/NEU.0b013e3182592faa. PMID 22513841. ^ LeVay S (December 1986). "Synaptic organization of claustral and geniculate afferents to the visual cortex of the cat". The Journal of Neuroscience. 6 (12): 3564–75. doi:10.1523/JNEUROSCI.06-12-03564.1986. PMID 2432202. ^ Zingg B, Hintiryan H, Gou L, Song MY, Bay M, Bienkowski MS, Foster NN, Yamashita S, Bowman I, Toga AW, Dong HW (February 2014). 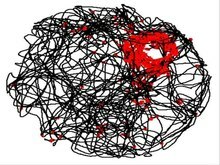 "Neural networks of the mouse neocortex". Cell. 156 (5): 1096–111. doi:10.1016/j.cell.2014.02.023. PMC 4169118. PMID 24581503. ^ Markowitsch HJ, Irle E, Bang-Olsen R, Flindt-Egebak P (June 1984). "Claustral efferents to the cat's limbic cortex studied with retrograde and anterograde tracing techniques". Neuroscience. 12 (2): 409–25. doi:10.1016/0306-4522(84)90062-9. PMID 6462456. ^ Smith JB, Alloway KD (December 2010). "Functional specificity of claustrum connections in the rat: interhemispheric communication between specific parts of motor cortex". The Journal of Neuroscience. 30 (50): 16832–44. doi:10.1523/JNEUROSCI.4438-10.2010. PMC 3010244. PMID 21159954. ^ Smith JB, Alloway KD (2014). "Interhemispheric claustral circuits coordinate sensory and motor cortical areas that regulate exploratory behaviors". Frontiers in Systems Neuroscience. 8: 93. doi:10.3389/fnsys.2014.00093. PMC 4032913. PMID 24904315. ^ Gabor, Andrew J.; Peele, Talmage L. (1964-11-01). "Alterations of behavior following stimulation of the claustrum of the cat". Electroencephalography and Clinical Neurophysiology. 17 (5): 513–519. doi:10.1016/0013-4694(64)90181-6. ISSN 0013-4694. ^ Silva G, Jacob S, Melo C, Alves D, Costa D (June 2018). "Claustrum sign in a child with refractory status epilepticus after febrile illness: why does it happen?". Acta Neurologica Belgica. 118 (2): 303–305. doi:10.1007/s13760-017-0820-9. PMID 28741106. ^ Meletti S, Slonkova J, Mareckova I, Monti G, Specchio N, Hon P, Giovannini G, Marcian V, Chiari A, Krupa P, Pietrafusa N, Berankova D, Bar M (October 2015). "Claustrum damage and refractory status epilepticus following febrile illness". Neurology. 85 (14): 1224–32. doi:10.1212/WNL.0000000000001996. PMC 4607596. PMID 26341869. ^ Shapleske J, Rossell SL, Chitnis XA, Suckling J, Simmons A, Bullmore ET, Woodruff PW, David AS (December 2002). "A computational morphometric MRI study of schizophrenia: effects of hallucinations". Cerebral Cortex. 12 (12): 1331–41. doi:10.1093/cercor/12.12.1331. PMID 12427683. ^ a b Cascella NG, Gerner GJ, Fieldstone SC, Sawa A, Schretlen DJ (December 2011). "The insula-claustrum region and delusions in schizophrenia". Schizophrenia Research. 133 (1–3): 77–81. doi:10.1016/j.schres.2011.08.004. PMID 21875780. Wikimedia Commons has media related to Claustrum. This page was last edited on 16 April 2019, at 22:39 (UTC).